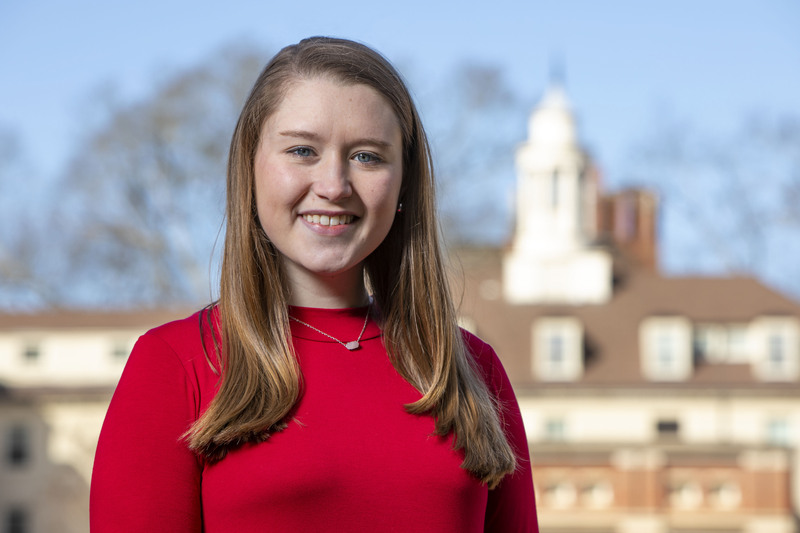 Future physician assistant Katie Luquire has immersed herself in research as an undergraduate, picked up some honors along the way, served her community and is well on her way to fulfill her passion of improving the lives of others. While both of my parents attended other schools, two of my aunts and one uncle attended UGA. My younger sister, Virginia, followed suit and is part of the Class of 2021 and my cousin, Davis, is part of the Class of 2022. We are slowly becoming a family of Bulldogs! One of the biggest highlights of my undergraduate career has been joining professor Kevin McCully’s Non-Invasive Muscle Physiology Lab during my sophomore year. During my time in the lab, I have completed two projects and attended six conferences to present my research. I have also received a research assistantship through CURO and the Michael E. Penland award from the department of kinesiology, both of which have supported my projects and conference travel. Last summer I also received the CURO Summer Fellowship for a project in which I developed a new method of measuring mitochondrial capacity. While traditional tests target a whole muscle group, my test generates near-infrared signals from specific regions of muscle. I used this analysis to test the finger flexors of piano players from the Hugh Hodgson School of Music, which I wrote a CURO thesis on and am currently working to publish as a first author. Coming into college I knew I wanted to do research, but I had no idea how much of an impact it would have on me. My peers in lab have become not only colleagues, but friends and I am thankful that I attend a research institution with ample opportunities to participate in undergraduate research. I am currently the editor-in-chief of Stethoscope Magazine, a publication for students interested in health care careers. We provide up-to-date health care news, guidance on making the most out of an undergraduate experience, and tips for applying to professional and graduate schools. During my time as editor-in-chief, I have worked with the rest of the editorial board to broaden our readership to include allied health and nursing students, developed a reader Listserv to improve access to content, and expanded our staff from 17 members to 45. We have also modified our biannual Leara Scholarship to include opportunities for both writers and photography/design. In addition to my role as editor-in-chief, I also serve as a writer and copy editor. Most recently I interviewed professors and pre-med students who are majoring in biological engineering and exercise and sport science for a second installment of the series “Alternative Majors for Pre-Health Students.” Without question, the most rewarding aspect of my role so far has been communicating with staff members and other members of the editorial board. Over the past year I have been fortunate to have an editorial board that works well together and is open to change for the benefit of the magazine. In the future, I hope that we will continue to provide reliable and relevant information to those who need it most – future healthcare providers. The summer after my sophomore year, the Freeman Asia Scholarship and the Honors International Scholarship Program allowed me to travel abroad for the first time on an Athletic Training Maymester to Taiwan. In Taiwan, I learned about global issues in sports medicine and medical treatments for sport-related injuries. I was also able to practice traditional Chinese medicine, including fire cupping, acupuncture and acupressure massage. The Maymester also had a shadowing component, so I was able to observe sports medicine practices in non-traditional sports such as tae kwon do, wushu and tai chi. I found it interesting how laws and regulations, such as redshirting, influence the practices of sports medicine and increase access to health care. While in Taiwan, I was also able to explore night markets, visit a 400-year-old temple, look down from the top of Taipei 101 (one of the tallest buildings in the world), and attend a Taiwanese professional baseball game. For the past three years, I have also been an ambassador for the Honors Program. Through this role, I participate in parent society and donor tailgates and attend the annual Gala of Giving dinner. One of my favorite aspects of being an Honors Ambassador is speaking at the Admitted Student Days, where I have the opportunity to share my favorite experiences at UGA and answer questions from incoming freshmen. I remember how stressful the college hunting process can be, so being able to support those students and their families is rewarding. Every Monday I attend the Medicine in Literature Book Discussion in the lobby of Myers, my freshman-year dorm, to discuss medical literature and news. A local OB/GYN attends the meetings and I always enjoy hearing her talk about her experiences and how they relate to our book. The 14 other undergraduate students involved in the discussion all are from various backgrounds and have different medical experiences, so it’s also interesting to exchange medical anecdotes. 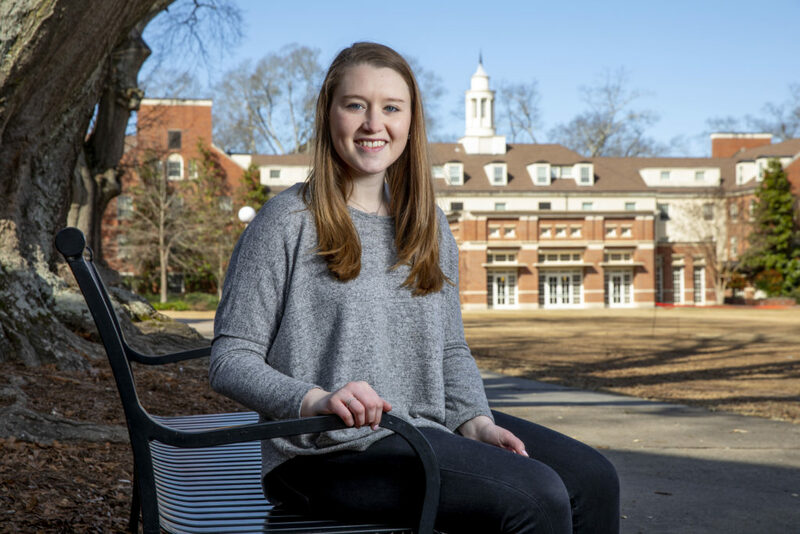 Throughout my time at UGA I have also been involved in the Blue Key Honor Society, Phi Kappa Phi Honor Society, the Pre-PA Association, tutoring for the Athletic Association, and the Exercise is Medicine Club. I have also volunteered with the Athens Humane Society, Shop with a Bulldawg and ServeUGA. During the summer before my senior year of high school, I visited UGA’s campus on a rainy day, so unfortunately our self-guided tour was meager at best. However, I had made an appointment to meet with the academic advisor for the Exercise and Sport Science program, who took the time to describe to me why UGA and the ESS program was so unique. She discussed the classes I would be taking in the major and how much of an emphasis the major places on exercise as medicine. The discussion I had with her made me excited about my future and was a main factor into my decision to attend UGA. Family is also a huge part of who I am, so it was important to me that I attend a school that was relatively close to Atlanta. I considered other schools that were farther away, but being within a few hours driving distance to my house has been fantastic. Similarly, my family raised me to be a huge SEC football fan, so attending a school with a team I could cheer on both during college and as an alumna was a priority. I was also fortunate to have received the Zell Miller Scholarship, so a large part of my decision rested on the fact that my tuition would be paid for. … walking around and taking in the scenery! UGA’s campus is beautiful, especially in the fall. I try to walk as much as I can and listening to music or a great podcast makes the time fly by. Lunchbox Lectures are another one of my favorite things to do on campus. Once a week, the Honors Program invites a UGA professor to come in and discuss their area of study. As a science major, I feel like I can get stuck in my own domain of learning so I’ve enjoyed hearing about research in different fields and getting a free burrito in the process! UGA’s campus also has a wide variety of places to grab food or coffee. Some of my favorites include pancakes at Bolton, cappuccinos from Jittery Joe’s, and late night cereal from Snelling. Some of my favorite memories of freshman year occurred while snellebrating with friends. … running, hanging out with friends and finding new restaurants to try. Athens also has a great music scene, so I love going to concerts at the Georgia Theatre. My favorite band I’ve seen in Athens is definitely Moon Taxi, who I’ve now seen three times! I’m also a huge dog lover, so I like to volunteer with the Athens Humane Society when I have time. … complete three half marathons! Running a half marathon had been on my college bucket list, so during my sophomore year I signed up for the AthHalf in October. The race went through some of the parts of Athens I had never been to, like the historic neighborhoods off Milledge Avenue and Bear Hollow Zoo. The course also finished with a loop around the field in Sanford Stadium, providing me with some much needed motivation at the end! The sense of accomplishment at the end of that race was unbeatable and it was amazing to see how my hard work had paid off. I completed my third AthHalf this past October and I hope to make the race an annual tradition after I graduate. … the first floor of the Main Library by the big windows. I have also spent many afternoons finishing up lab reports and working on group projects in the Five Points Jittery Joe’s. Honestly, there are so many coffee shops in Athens — you really can’t go wrong with any of them! I have had many amazing professors during my time at UGA, many of whom I do not mention here, although I wish I could. However, each class has taught me something that has altered my worldview and shaped me into the person that I am today. Kevin McCully has been a fantastic research mentor for the past two years and his passion for science and understanding human physiology is truly contagious. I appreciate that he challenges all of his students to practice “active learning” to enhance their education beyond the classroom, which has taught me to avoid passive interactions and take control of my environment. The way Dr. McCully runs his lab is unique in that undergraduate students have their own projects and are involved in all phases of experimentation, which allows us to understand the significance of our research on a deeper level. Dr. McCully also serves as an excellent academic and professional mentor. He constantly emails us new scientific articles, many of which we discuss and debate in the lab. Dr. McCully is also extremely involved in his community. He emphasizes improving the lives of those with disabilities through his involvement with the Shepherd Center and through his Disability Wellness Class, which I admire. Dr. McCully has taught me a great deal about serving as a kind yet effective leader, the importance of collaboration, and impactful patient care. Rob Nichols was one of the most engaging professors I’ve had at UGA. His “Anatomy and Physiology” class is where I began to find my love for medicine, most of which is attributable to the fact that he tied in real-world examples to every physiological system that we learned. When I found out that Stethoscope Magazine needed a new advisor, I knew I wanted professor Nichols to fill the role. Over this past summer, we sat in his office discussing article ideas and possible improvements to the magazine for at least two hours before realizing how long we had been chatting. I am grateful for both his leadership and his helpful professional advice. Rodney Dishman is objectively one of the funniest professors I’ve ever had, especially if you’re a fan of dry humor. Last semester he taught my “Exercise Epidemiology” class, where I learned about, and now strongly advocate for, exercise as preventive medicine. What I learned in that class will unquestionably serve me well as I begin a career in medicine. … Katie Couric. She was the first solo female anchor of a major network evening news program, and is still active in the media industry today. I was listening to an interview with her the other day, and she mentioned that when she doesn’t agree with someone she tries to put herself in the other person’s shoes, which I think we can all learn from. She is also a strong advocate for public health, even getting a colonoscopy on “The Today Show” after losing her husband to colon cancer. I would love to spend an afternoon with her to discuss history, politics and public health. … make every city walkable. Current estimates say that only about 20 percent of the American population meet the recommended guidelines for physical activity. As a result, the prevalence of obesity and other related diseases is steadily increasing, which is placing a massive burden on public health. However, by simply walking for 30 minutes a day, the risks for cancer, cardiovascular disease, diabetes and many other diseases drop dramatically. Walkable cities would provide an easy way for everyone to get the physical activity that they need in order to decrease disease rates and boost public health. As a college student, I have enjoyed having the ability to walk to class and to take walking breaks between classes. This has had a profound effect on my mental health and overall well-being, and I am certain that our nation’s quality of life and morbidity rates would improve dramatically if every city were walkable. … travel. I love to explore new places and cultures, and I would gladly travel the world if I could. Long term, I think my ideal situation would be to work in medicine in different parts of the world. My study abroad in Taiwan introduced me to different types of medicine, and I would be interested to learn more about how other countries treat their patients and run their health care systems. T.R. Reid discussed his global travel to find the most effective means of providing health care in his book, “The Healing of America,” so I could see myself doing something similar, except instead of analyzing the health care, I would like to learn about differences in patient care around the globe. My passion is improving the lives of others. I enjoy learning more about others, listening to their stories and figuring out how to best assist them. After extensive shadowing, I intend to pursue a career in medicine as a physician assistant. I believe that working as a PA will allow me to best improve the lives of others by listening to their concerns, assessing their needs and developing a treatment plan to best suit them. I am particularly interested in preventive medicine, and for my patients, I hope to not only assess what I can do for their current problems, but also work to prevent other issues from occurring. I recently went to the Southeast American College of Sports Medicine Conference, where Dr. Kathryn Schmitz gave an interesting lecture on the importance of continuing research to evaluate the importance of exercise for cancer prevention and control. Dr. Schmitz’s address reaffirmed how grateful I am that I live in a time where preventive medicine is being evaluated, and I look forward to future discoveries that are made in this area. … work as a medical assistant in my gap year before attending PA school in 2020! I am currently interested in oncology, but I am open to other options as well. This isn’t something that happened on UGA’s campus, but rather occurred on my study abroad in Taiwan. One of the last days were there, we visited Sun Moon Lake and one of the activities we were scheduled for was a boat ride on the lake. We walk down to the dock only to find large wooden logs and some rope. What none of us (including the faculty advisor and TA) were told is that in order to ride in the boats we would first have to make them. Keep in mind that none of us had ever attempted to make a boat before. We start to tie the logs in a way that would hopefully hold, and about halfway through this process it started pouring down rain. At that point, all we could do is laugh. Eventually, we figured it out and were somehow able to ride on the makeshift boats without sinking into Sun Moon Lake. What I remember most is laughing with everyone about how ludicrous the whole situation was and feeling a bit of pride for making it through.